In retrospect, it appears it was only a matter of time before Jacques Audiard would tell the story of immigrants, considering how many of his films deal with the experience of assimilation. Whether it was the social climbing salesman who dishonestly reimagined himself as a celebrated Resistance fighter in “A Self-Made Hero,” the Arab prisoner who learns how to survive the pen in “A Prophet,” or the killer whale trainer who readjusts to life after losing her legs in “Rust and Bone,” the French filmmaker has always empathized with those attempting to break into a system and often transcend it, which is why his films feel so current in spite of where and when they take place. 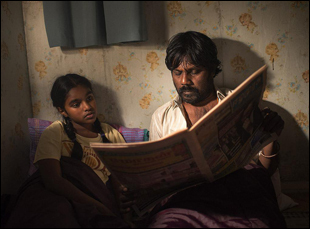 “Dheepan,” his latest, is no exception, centered on the rebel soldier of the title (Jesuthasan Antonythasan) who is forced to flee his native Sri Lanka in the midst of a civil war, picking up a young woman named Yalini (Kalieaswari Srinivasan) and Illayaal (Claudine Vinasithamby), a nine-year-old orphan, that pretend to be a family in order receive asylum in France. Yet once abroad, the trio discover that life isn’t necessarily easier in the slums just outside Paris, where Dheepan works as a janitor to secure them a modest flat, all getting used to their new conditions as much at the same pace they get to know each other as they also come to learn their new home is a haven for crime. With the three Sri Lankan migrants taking on dual identities, only slowly revealing themselves to each other as a trust begins to form when the pressures of putting on a public face take their toll, Audiard also shows both sides of himself as a filmmaker – uncommonly in touch with the human desire to belong and also unusually skillful in portraying the violence that can result when there isn’t acceptance. That clash of tones, which has bedeviled and bewitched audiences since the film won the Palme D’Or at the Cannes Film Festival last year, has become a hallmark of the director’s work, making him one of the most electric filmmakers in the world. While Audiard was in Los Angeles for the AFI Fest, he shared through a translator how “Dheepan” took shape, working with a cast of nonprofessionals in a language he doesn’t speak and why he’s making his English-language debut next. When I think back to “Self-Made Hero,” throughout your films there’s this idea of the outsider who finds his way within the system. Is it a coincidence you keep returning to that idea thematically? Not a coincidence. This is based on a supposition that the generation that was born roughly between 1940 and 1955 in France has been told a historic lie. The big question is what did our parents do during the war? In “The 400 Blows,” there was the questioning of the role of the father framed with the lie – what is it? So that’s something that my generation is saddled with and perhaps that’s the starting point for that exploration. When I became aware of this, it made me identify with a very specific generation in France. Five or six years ago, the point of departure was to remake “Straw Dogs” in government housing somewhere in France with somebody who’s an outsider from another culture. But the vigilante theme is not something I find very intelligent. It’s more of a frontal kind of story, so I had to find a secondary story to emanate from that. The idea of having a fake family unit then became an essential part of the story. Then the idea of where they came from, I didn’t want them to have any association with French history or French culture, so that ruled out North Africa or the old colonies, parts of Asia or Vietnam, but we found Sri Lankan culture, which is very separate – it’s part of the British empire, so that became the culture we wanted to draw from. Was your lead actor Jesuthasan Antonythasan’s own personal story actually an inspiration? His real-life story would seem to resemble the character he plays. First of all, he came in very late in the process, right before filming, and the character was already drawn out, so it’s more haphazard that his past coincided. I stumbled on it as we were already making the movie, so perhaps his past, or the similarities, were something that served the actor, but I didn’t dig into that. [Sri Lankan] culture is also very discrete and secretive about where they fit in the conflict, so we really didn’t discuss it that much. While talking about “A Prophet,” your co-writer Thomas Bidegain once said specifically about your films that your heroes aren’t heroes until they’ve suffered. Is that actually a starting place for you? Yes, the hero is born from this conflict and the quality of vulnerability is something cinematic – it belongs to the nature of cinema and only in cinema are heroes able to show their invulnerability to whatever they’re up against. It’s a very cinematic quality. You’ve said the story for the film evolved during shooting. Did seeing how your cast interact with each other inform what eventually went up on screen? As a screenwriter preparing for the film, the approach was to underwrite it. There are big passages that were blank, giving the space for us to explore while making the movie, so there’s an “improvisational” aspect. Because the actors come from nonprofessional backgrounds, to have something that was too written and closed would not have played in our favor and to keep it open and see them work and develop was the right intuition. Was it different to work with actors who spoke in a different language than you – does it allow you to concentrate on expression? The stakes of directing shift so you’re not listening for language or the meaning of the language. It becomes more of a musical approach. You’re listening for the sound or the rhythm, the expression and in that, the director becomes almost like a conductor of an orchestra. If it sounded right to me, [I thought] it must be right and there’s something in their culture that even though they’re not trained [as actors], there’s a Bollywood [tradition] where the acting’s very expressive, so my job was to bring them down, notice what their expression was and to feel as if those moments were almost like sheet music and work on that register. One of the most remarkable shots I think I’ve ever seen in any film is in “Dheepan,” where Yalini leads Dheepan into the bedroom, and you see her disappear into the darkness after slipping through this pool of light in the hallway of their flat. Was it a difficult shot to achieve? You’re a very attentive viewer of the film. [laughs] So this gradual, almost like a fade to black is something that was technically planned — there was the room that had one [kind of] lighting, the hall had less lighting and then they step into the darkness and it’s almost like a natural fade out. The intention was in the culture and for the woman, there’s a lot of discretion because even showing a little bit of the body can be pornographic. So that was part of my direction to the actress is that the natural fade to black would be a respect of her own misgiving of showing anything of the flesh. Your next film is an English-language Western. What prompted shaking things up? It’s very simple. I have a desire to work with American or anglo actors. That’s the reason why – and it’s a good reason. 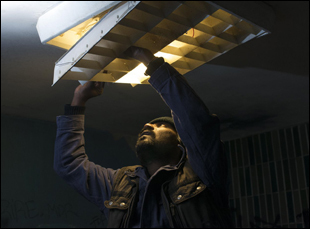 “Dheepan” is now open in New York at the IFC Center and Los Angeles at the Laemmle Royal. A full list of cities and dates is here. Interview: Abigail Disney & Rev. Rob Schenck on Firing Up "The Armor of Light"
Interview: John Crowley on Finding the Face of "Brooklyn"